You are here: Home / Branding / Are the 2015 Super Bowl Commercials as Important as the Game? Imagine paying over $4 million for a 30 second spot on Tv, an investment that may be worth it for one of the biggest branding days of the year. The Super Bowl is one of the most watched events in America with over 100 million viewers. This is a guarantee that many are going to see your ad and talk about it, hopefully in a positive way. Along with the success in the Super Bowl commercials, there have been some big failures. Every year somebody’s ad fails, confuses viewers, offends others, and falls short of high expectations. For example, Go Daddy just had their 2015 ad from viewing on Sunday. This ad shows a puppy’s journey home to then be sold by his owner online, a site hosted by Go Daddy. Many people are offended by this sating that most animals sold online come from conditions. Animal rights advocate, Helena Yurcho, launched a Change.org petition to remove the commercial ad that received over 40,000 signatures. Now Go Daddy has removed this ad and will fill the spot with something less controversial #Pulled. It’s not only about the commercials anymore but social media has stepped into the game more and more over the years. It is becoming more about the conversation through Facebook, Twitter, blogs, and forums during the Super Bowl through many topics. 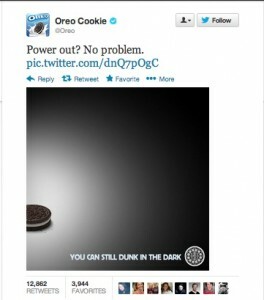 A great example of smart social media action is the Oreos hit from 2013: “You can still dunk in the dark” tweet. This was an unexpected event when the power went out and the Oreo team acted quickly in the moment. Don’t only just be in the moment and be genuine, but get your customers involved in the conversation as well. We would love to know which Super Bowl commercial is your favorite! Please leave a comment with your favorite commercial old or new.